Two seasoned veterans are trying to keep their struggling Korea Baseball Organization club afloat after opening their season on a down note. Samsung Lions' starter Jang Won-sam and outfielder Park Han-yi are two of the few remaining pieces from the club's dynasty years from 2010 to 2015, a six-year span during which they made every Korean Series and won four consecutive championships starting in 2011. But since losing to the Doosan Bears in the 2015 Korean Series, the Lions have fallen on hard times. They finished in ninth place among 10 clubs in both 2016 and 2017 and are now in last place this season at 14-23. When teams are playing that poorly, they often try to find positives from small things. And the Lions have just that small thing to feel happy about -- their first winning streak of the season, and a two-game run at that. And Park, 39, and Jang, 34, were instrumental in those two wins. Jang picked up his first win of the season last Saturday against the Hanwha Eagles, holding the surging opponents to three runs over seven innings in an 8-3 victory. 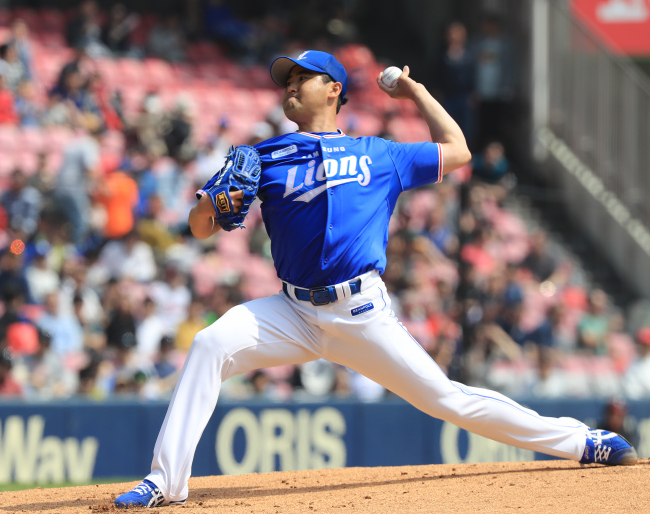 The Lions' game on Sunday got rained out, and they won their next game on Tuesday over the KT Wiz by 9-4, as Park went 2 for 3 with his first home run of 2018 and three RBIs. ($509,850) and re-signed for 200 million won. Park's salary was nearly halved, from 450 million won in 2017 to 250 million won this year. They were nowhere to be found earlier in the year. Park made the Opening Day roster but was demoted to the minors after hitting .111 (2 for 18) in his first six games. He returned on April 13 and batted .412 (7 for 16) in five games but was sent back down to the minors. Park, one of the KBO's premier contact hitters in his heyday, rejoined the Lions on May 4 and has batted .455 (5 for 11) with five RBIs in three games since. Jang, once a front-of-the-rotation ace, didn't make the 25-man roster to start the season. He threw a quality start in his season debut on April 18 against the Lotte Giants, giving up three earned runs in six innings while striking out seven, but he was taken off the active roster the following day. He struggled in his next start on April 29 against the LG Twins, giving up four earned runs over four innings. But when Jang got another opportunity last Saturday, the left-hander delivered a victory.